Having just sent off an e-mail to a friend where I managed to use the words "place" or "places" five times in perhaps four sentences, I'm in one of my incipient Alzheimer's fugs. Just the time for a little digression on Bedlam. 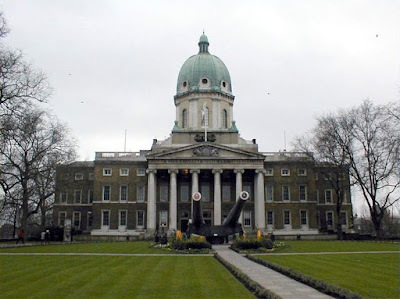 Our flat is within leisurely walking distance of the Imperial War Museum. The building that now houses tanks and missiles (possible irony here? ?--evidence of another variant on the ways we humans can lose our capacity to reason) was, from 1815 to 1930, Bethlem Royal Hospital, an asylum for the insane. This was the hospital's third home; it has now been moved to a fourth, outside the city in Kent, which still provides mental health care for the inhabitants of our borough, Southwark. Pleasant though today's Eden Park location may sound, I'm not exactly keen to find myself at the receiving end of its services. . . which isn't to imply that these would in any way resemble what passed for therapy in less enlightened centuries. We can complain of present standards and, yes, there are certainly still horror stories, but institutionalized mistreatment of patients for amusement and profit is, thank our lucky stars, a thing of the past. Originally a priory for the order of St Mary of Bethlehem, the hospital was founded in Bishopsgate in 1247, on the site where Liverpool Street Station now stands. During the 14th century it became a sanctuary for the poor and sick--and, as time went on, exclusively for the mentally disturbed. Before Bethlem was moved to Moorfields in 1676, a further condensation of the word "Bethlehem" had entered the language as "Bedlam." "Bedlam" then became a generic term for an asylum or any inmate thereof. Hooke's inventive use of the microscope resulted in his coining the word "cell," and for the wards at Bethlem he used the same image of the monk's cell that had inspired his neologism. 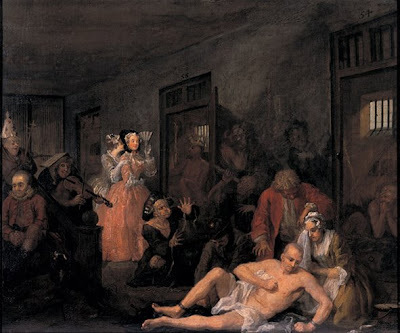 You can see these in the background of Hogarth's painting at the start of this post--and the wealthy woman and her maid who have come to gawp at the patients. The Rake has descended from carefree extravagance through the Fleet debtors' prison to the ultimate degradation, Bedlam. 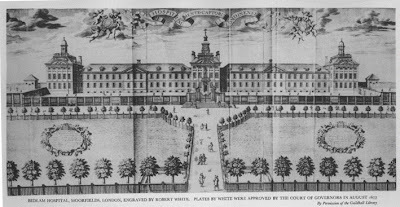 The Moorfields building, the second home of Bethlem Hospital from 1676 until 1815, was one of the grandest in the city and lavishly ornamented. Design and function were influenced by Bethlem’s growing popularity as a London show. Patients were forbidden to use the front garden, as this would have necessitated a rise in wall height, so obscuring the view for the passer-by. By 1770, this public sight-seeing was deemed inhumane and finally stopped. I'll spare you the more gruesome details I've come across; they don't make pleasant reading. This was, after all, a period in which even supposedly advanced medical practices would now be considered barbaric. When you read that the governors of Bethlem sanctimoniously refused to install glass in windows because they believed fresh air, even in freezing winter weather, eliminated "the disagreeable effluvias peculiar to all madhouses," you can imagine what other practices were quietly tolerated. By the end of the 18th century, Hooke's fine edifice was in as great disrepair as its predecessor had been, and the decision was made to move the hospital from the marshy location (Moorfields is named that for a reason) which meant it had been built with no foundations. So another structure arose, again impressive on the outside and wretched within. Some felt that in the move south of the river, the institution had arrived in its natural habitat, since Southwark was also home to Marshalsea debtors' prison and, prior to its destruction by fire in 1780, the notorious Clink. Incarceration of any sort could be a profitable enterprise. A couple of blocks from our flat a wall remains from one of the other dubious institutions that would be embraced by the Victorians, the parish workhouse. The statues of Melancholia and Raving Madness had been moved with the patients in 1815, not a propitious sign. Physical punishment was still the prevailing treatment in the new hospital, even after the outcry in 1814 when it was discovered that one patient had remained chained for fourteen years. But the times were a-changin'. Two public inquiries lambasted Bethlem Hospital and, as a result, more serious attempts were made at genuine treatment, supervised by regular government inspections from the 1850s. Keepers were replaced by--or became--nurses. Medical care and work therapy became standard. Fortune favored the patients in one regard: since the hospital had its own water supply, they were spared the outbreaks of cholera and dysentery that afflicted other London residents. By the time inmates classified as criminally insane were transferred to Broadmoor in 1864, penniless middle-class patients were often appearing on the rolls as well as the "common poor." [It would appear that Hogarth's Rake must have been an exception not a rule back in 1732/33.] Treatment very much depended on class. Although Thomas Monro, Bethlem's physician, was relatively humane in his advocacy of strait-jackets rather than chains, he had testified in 1816 that "I have nothing in the world to do with the irons; I never gave orders for the patients to be put into irons in the whole course of my life. . . [chains and fetters] are fit only for pauper lunatics: if a gentleman was put in irons, he would not like it." God save the "deserving poor" from the clutches of those who felt they could decide exactly what it was they deserved. In 1930 Bedlam moved again. London was becoming more and more unhealthy to live in, and Southwark was not considered socially acceptable for the educated ladies and gentlemen who were receiving treatment there. The governors and staff wanted 'light, air and space' with 'ultra modern' facilities. No wonder when we bought our flat in 1995, our rather prissy solicitor in Sherborne told us that the area was "convenient but not salubrious." A distinguished French scholar attributed the problem of madness in England to "the mixture of fogs, beef and beer aggravated by the rigours of nonconformity and the tedium of the English Sunday."